It has been a couple of weeks since our Guatemala Info Meeting. If you missed that meeting, please feel free to ask Jim Kolesar or Carol Kutzer for further information. If you are reasonably certain you plan to be part of the mission trip then we need a deposit of $200 by May 1st. 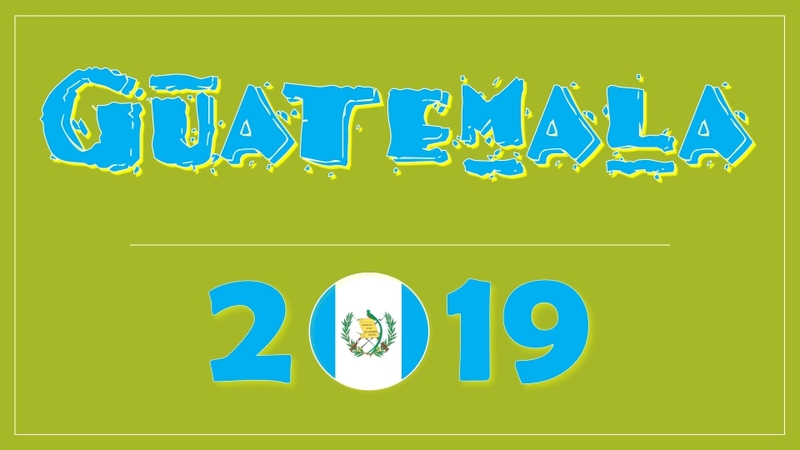 Please write your check to “Cornerstone EPC” and write “Guatemala 2019” on the memo line. We are beginning to collect luggage for the trip. This luggage will be used to transport donated items and our VBS gear. We will leave the the luggage in Guatemala. If you enjoy shopping at thrift stores and garage sales, please keep this trip in mind. It is time to start fund raising now. We have a form letter which you can use to send out to friends and family now. However, please do not send it to your Cornerstone family. We don’t want them to be inundated by requests. Cornerstone has a rich VBS history…although it has been a few years since we’ve hosted one. Now that we no longer are housing The Arc of Katy each summer, we can return to blessing our neighborhood. And just how do we do that when such a large portion of the children in our neighborhood speak Spanish? 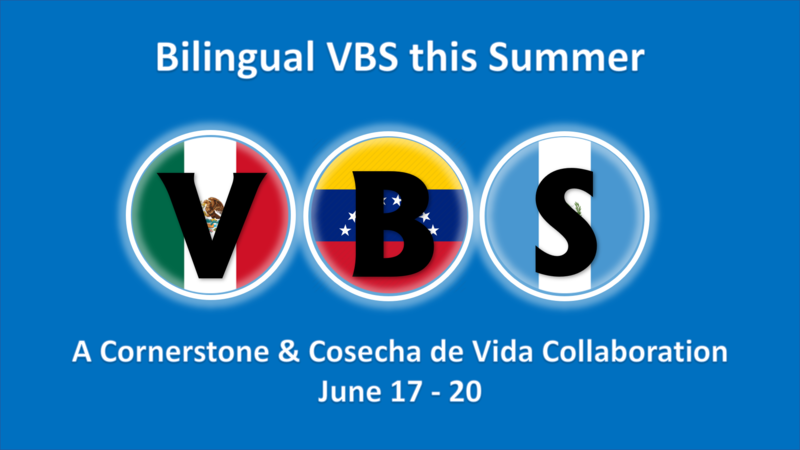 The obvious answer is collaborating with Cosecha de Vida and hosting a bilingual VBS. This is a HUGE need in the Katy area – not just Memorial Parkway. There are endless options for English speaking children….but not for Spanish speakers. We are behind schedule getting this ball rolling, but we are trusting the Lord to provide all we need – supplies, volunteers and children! Be on the look out for more information, but here is what we can share for now. Who? This will be an all-hands-on-deck event. Even if you cannot volunteer at the event, you can help out behind the scenes in some fashion. What if I’m not bilingual? It’s not necessary because members of Cosecha de Vida are. Each class will have an English and a Spanish teacher and assistants. Can Cornerstone children participate? Absolutely! This will be an excellent opportunity for our children to help welcome visiting children and make them feel at home. What ages may participate? Students should be at least 4 years old, potty trained and able to handle a chaotic atmosphere. Age limit for students will probably be 10 years old. Anyone older can volunteer! The most immediate need? PRAYER! And we need a few people to help us plan this event. This team will also include members and leadership from Cosecha de Vida. How can I sign up to help? For now, contact Carol Kutzer. Immediately following worship service on March 31, there will be a brief meeting for those who want to learn more about a possible Guatemala mission trip this Summer. The meeting with take place in the Fellowship Hall. During worship service this Sunday (March 24) Pastors Eric DiCesare and Pablo Monroy will share about a possible mission trip to Guatemala this summer. You’re invited to join us March 23rd for a morning of colorful fun! This family fun event is a joint fundraiser between Christ Clinic, Clothed by Faith, Compassion Katy, The Ballard House, Katy Christian Ministries, and Hope Impacts; nonprofits that aid the under-served in the Katy community. Register to: Run/Walk/Volunteer/Sponsor or Be a Vendor! Can’t participate in the race or want to participate from home? Donate to the race and your donation will help 6 local nonprofits continue to change the lives of local families in need! There are still a few menu items that no one has signed up to bring. If you have not done so already, please click here to sign up to bring food, RSVP, or offer to help. Thank you! Be sure to mark your calendar February 24th! We are going to enjoy a morning of blessings with an EPC Missionary to Lebanon whom Cornerstone supports financially. She will speak during our Sunday School hour and also a few minutes during Worship. After the service we will welcome her (and possibly her daughter) with a Lunch in Fellowship Hall. This missionary and her husband have been our lead missionaries in that country for several years and are spending about six months on home leave now. 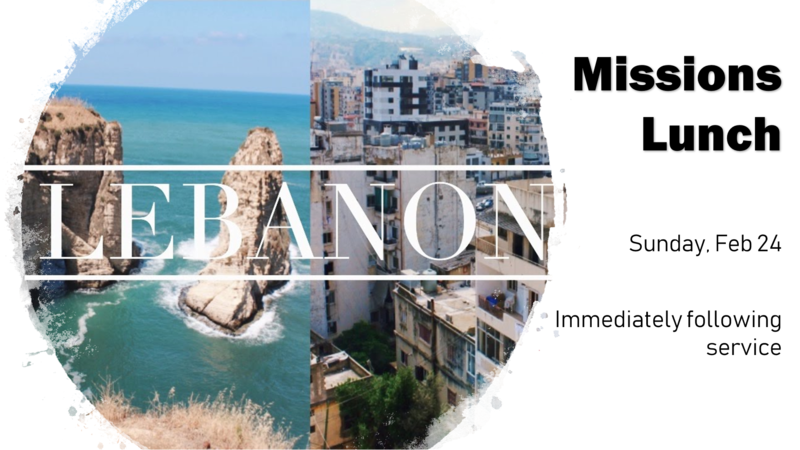 What a joy it will be to hear how she and her husband (and their two children) have been led in Lebanon and what God is doing in their lives. An RSVP card will be handed out soon – please let us know how many of you will be attending the lunch so that we will have enough food prepared. Cornerstone will provide the meat but we will be posting a Sign Up Genius for the sides, dessert and ways to serve. This Missions Lunch will not only be a loving welcome but also a celebration of the work being done in the name of our Lord. Come and meet her! You may leave your donations in the red barrel in the Carol Kutzer’s office. Write a letter to the family who will receive the meal. Include a favorite recipe with all the ingredients with a special note as to why it’s a family tradition. Pray for the families receiving the meals. 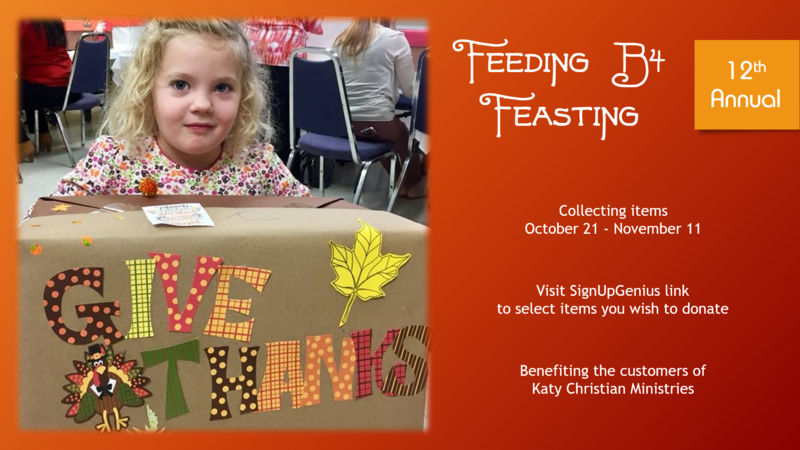 The CSCK families will spend the morning of November 11th decorating boxes and writing letters and prayers to the KCM customers.